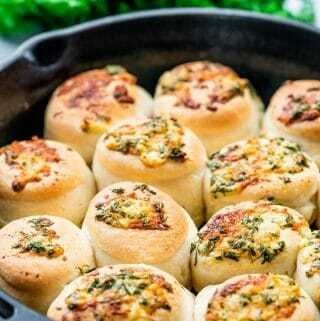 There’s no better accompaniment on your dinner table than these Garlic Parmesan Skillet Rolls! These homemade rolls are so soft, and baked away in an ultra garlicky butter sauce with fresh parmesan cheese. DO I NEED TO USE A STAND MIXER? While a stand mixer will make the process easier, it is not required to make these rolls! While the yeast rises, mix the rest of the ingredients together in a large bowl. Add the yeast mixture, and combine everything well using either your hands or a wooden spoon. Turn the shaggy dough onto a lightly floured surface, and knead by hand until a slightly sticky dough ball forms, adding small amounts of flour as needed. It really is a great workout! 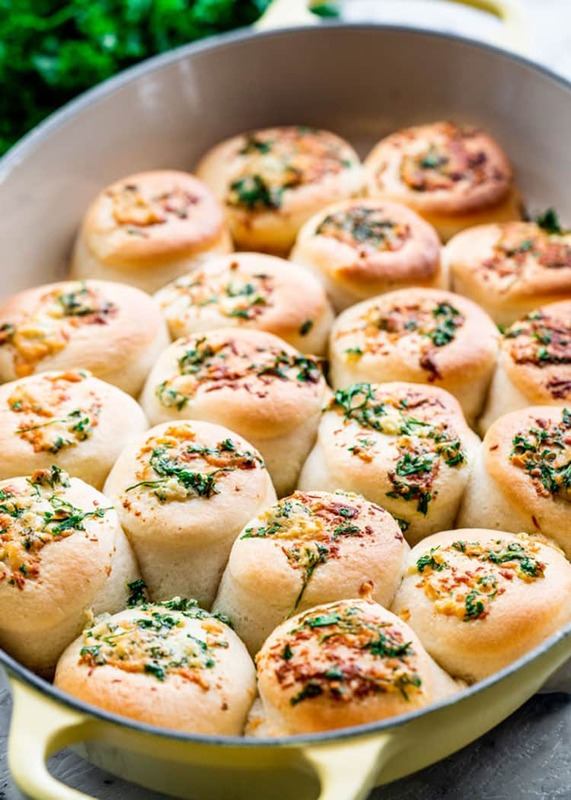 We used active dry yeast for these garlic parmesan skillet rolls. If you have instant yeast on hand, that will work as well. When using instant yeast, you don’t need to proof it! Simply throw all the ingredients together in the bowl and begin mixing. If you haven’t used your instant yeast in a while and you aren’t sure if it’s still alive, you can still proof it in the warm water. If it foams up nicely, you’re good to go. WHY DIDN’T MY DOUGH RISE? Yeast Is Too Hot: If using active dry yeast, it needs to be dissolved in either warm water or milk. If you heat up your liquid too much, this will kill your yeast. Yeast is pretty picky. It doesn’t like cold and it doesn’t like too hot. Between 100 and 110 degrees F, or just warm to the touch, is perfect for proofing yeast. Not Enough Time To Rise: Sometimes you just have to wait it out. I’ve had dough that really took 3 hours to double in size. Patience is key. If the recipe says to let it rise for 1 hour until doubled in size and yours hasn’t, just give it more time. Don’t forget that a slower rise results in a more flavorful bread. If you’re in a rush, you can always use my tip above by warming up the oven first. WHAT OTHER TOPPINGS CAN I USE FOR THESE ROLLS? Want to switch it up from garlic and parmesan? No problem! Begin by brushing the rolls with butter, or if you want shiny rolls, brush with egg wash. Now you can top these guys with anything you want! Try out some everything bagel seasoning, sesame seeds, chili flakes, big flaked sea salt, or leave them plain. CAN I FREEZE GARLIC PARMESAN SKILLET ROLLS? Yes you can! These rolls can be frozen either before or after baking- it’s totally up to you. Give them a good 2 hours to thaw if you freeze them before popping them in the oven to bake. If you freeze them already cooked, they should thaw out in a minute or two in the microwave. 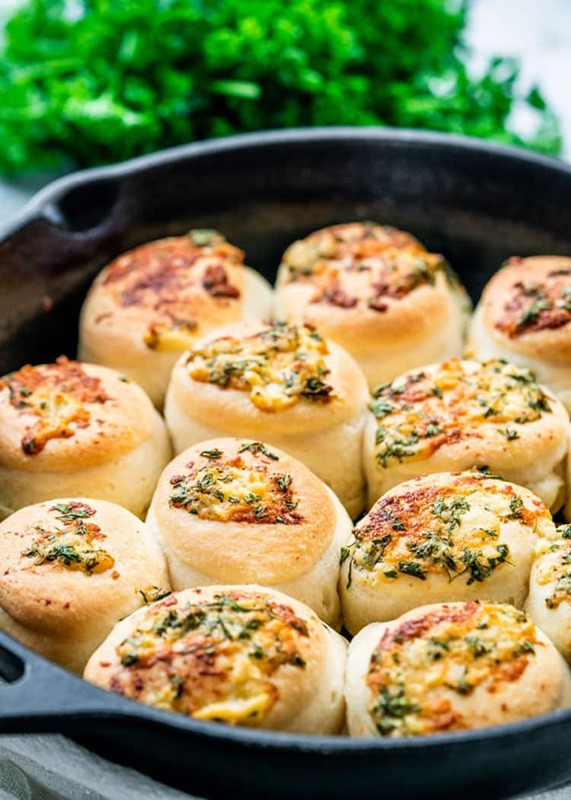 There's no better accompaniment on your dinner table than these Garlic Parmesan Skillet Rolls! These homemade rolls are so soft, and baked away in an ultra garlicky butter sauce with fresh parmesan cheese. In a small bowl, mix warm water with yeast and 1/2 tsp sugar. Allow to proof until foamy; about 5 minutes. Add the powdered milk, 3 cups of flour, remaining 1/2 cup sugar, cream cheese, salt, and the yeast mixture to the bowl of a stand mixer. Mix until the dough begins to pull away from the side of the bowl, adding flour as needed to create a slightly sticky dough. Turn the dough out onto a floured surface and knead a few times. Place the dough in a lightly greased bowl, cover with plastic wrap, and allow to rise for about an hour, or until it's doubled in size. Punch the dough down and turn it back onto the floured surface, and knead a few times. Cut the dough in half and roll each half until its 1/2" thick. Cut into rounds with a biscuit cutter. Place each piece around a lightly greased skillet. Cover and let it rise again until doubled in size. 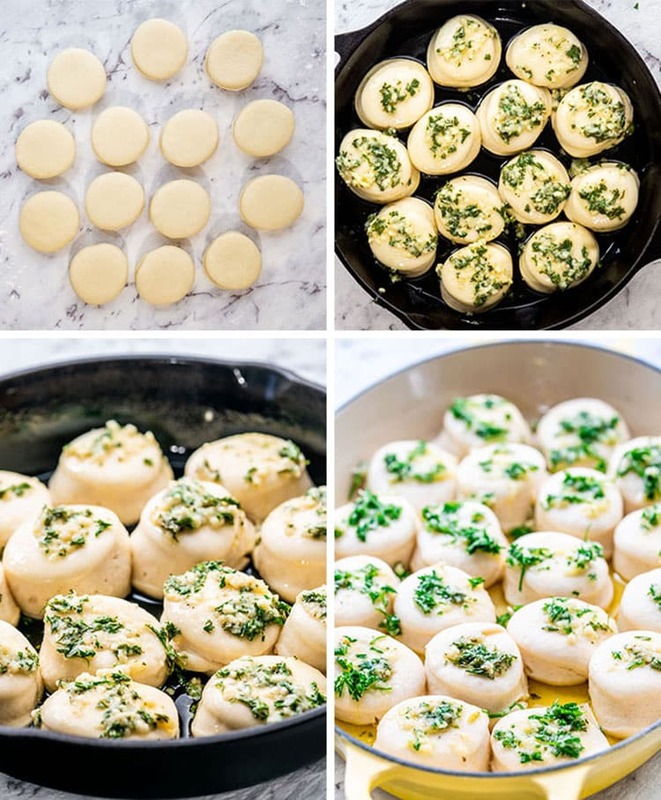 While the dough is rising, mix the melted butter with parmesan cheese, parsley, garlic, remaining 2 tsp salt, and pepper. Brush the rolls generously with the garlic parmesan butter. Bake until golden brown, about 12 minutes. If you use whole wheat flour, reduce the amount to 2 1/4-3 cups. All of your recipes are so good especially the desserts. Is it possible for any of them to be modified for diabetics? Sorry, Anna, but I’m not an expert on a diet suitable for diabetes!